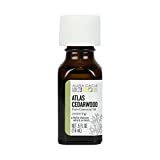 Cedarwood Oil comes from trees of the Cedrus family. True cedar is a genus of four species of evergreen conifers, Cedrus atlantica, from the Atlas Mountains of Morocco, the Lebanon cedar from Syria and south-east Turkey, the Cyprus cedar and the Himalayan cedar. The cedar is a giant of a tree that can live for hundreds of years. It was prized for its rot and insect resistant wood. The essential oil from cedars has been used since ancient times and is one of the first crude essential oils to be extracted. The Egyptians used it for mummification purposes and it was also used as a preservative for parchment and clothing. The cedar tree appears in the bible where it symbolises fertility, abundance and might. Cedarwood Oil in the US comes from junipers and is similar to the true cedar oil but not identical. The oil is extracted from the wood chips by steam distillation and ranges from pale yellow to orange-brown to brown in colour, depending on the species of wood used and has been described as syrupy and balsamic. All Cedar Oils have a characteristic woody aroma. Cedarwood Oil has a complex make up but the major constituents are terpenic hydrocarbons, thujopsene, cedroI and sesquiterpenes, especially cadinene. Cedarwood oil is antiseborrheic, meaning that it normalises sweat gland secretion. It is also antiseptic, anti-inflammatory and astringent, clearing skin of impurities and giving it better tone by tightening pores as well as calming any irritation and redness. It is antispasmodic and has the same tightening effect on muscles that it does on pores. It is an expectorant and helps clear away excess mucous as well as helping to calm respiratory passages. It stimulates and sedates and is good for grounding and removing negativity. Cedarwood Oil is very concentrated so should be measured by the drop. It is well suited to products like shaving creams and after shave and is added to shampoos for the treatment of alopecia. Cedarwood can be used in any skin disorder for its astringent and antiseptic effect but it is especially good for seborrheic dermatitis. This is a fairly common, chronic inflammatory disorder that is marked by scaly, flaky, itchy and red skin typically in sebaceous gland rich areas on the head and trunk. If used topically, it can be used neat in small quantities except on very sensitive skin. Otherwise it can be diluted with a carrier oil and used for massage, as a moisturiser for dry skin, wrinkles, acne, eczema and blemishes and as an insect repellent in sprays, candles and creams. 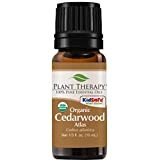 Cedarwood Oil massage is great for arthritis, stress, muscle spasms and any kind of tightness, such as bronchitis. It is uplifting, warming and comforting, as well as calming. It can also be used as a steam inhalation or added to bath water where it is useful for its relaxing, sedative effect as a nervine tonic. Breathing Cedarwood Oil vapours is a natural remedy for respiratory problems like bronchitis, sinusitis, asthma, coughs and congestion in colds and flu.